Marjorie's Busy Corner: Wednesday...where does the time go? THis week I am fighting headaches each day, but moving along. I did finish and am shipping this morning...these quilts for customers. 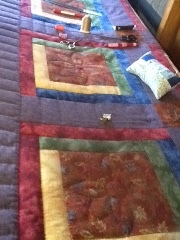 THis is a large queen size quilt, hand quilted...love this soft fabric. It is a wedding gift from my customer. And this one...I apologize because I neglected to get a picture of it finished before packing it up. 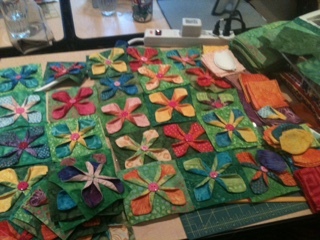 But seriously, there is so much going on with the little flowers...you can't see the quilting. This is a bed runner with a cushion to match. I met the owner on the cruise ship, and was delighted to do this for her. I am now hand quilting this one.. 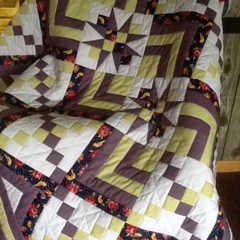 This is a customer quilt made from gorgeous flannel. I was afraid it would be hard to hand quilt, but not so! I have a couple of crib quilts to machine quilt...and many more large quilts waiting. I am also starting a snow geese quilt..just have a few pieces cut...so maybe next time there will be something to show you. We'll have to get to it here folks...have a great rest of the week!!!! Those flowers are super cute! Beautiful work as usual Marjorie! I hope your headaches clear up soon.....that can't be fun. That wedding quilt is gorgeous, Marjorie. I LOVE those dimensional flowers. How did you quilt something like that? Your quilting is always so inspiring. No wonder the time flies for you.